Each year, the Center selects a limited number of deserving students (in any field of study) for Foreign Language and Area Studies (FLAS) Fellowships (for academic year and for summer), Center Fellowships, and Center Field Research Grants. Applicants must demonstrate the student’s commitment to the study of a Southeast Asian language and area studies, and applicants for FLAS fellowships must be citizens or permanent residents of the United States. Applications and supporting materials for these fellowships must be submitted by the application deadline (usually mid-February) each year (see below and the current application forms and deadlines). If you are applying for the FLAS Fellowship, the Center Fellowship and/or the Center Field Research Grant for the 2019-2020 school year, you do not need to submit separate sets of supporting materials. You may request us to use supporting materials such as transcripts, your GRE report, and three letters of recommendation interchangeably for your different sets of applications. You may want to submit different statements of purpose for each of these applications. The Center for Southeast Asian Studies intends to award up to seven (7) FLAS fellowships to graduate students who will be enrolled in 2019-2020 for intermediate (2nd-year), advanced (3rd-year), or higher level study of Filipino (Tagalog), Hmong, Indonesian, Thai, or Vietnamese at UW-Madison. Graduate student FLAS Fellowships for the academic year provide a monthly stipend, full tuition payment, and health benefits. Only citizens and permanent residents of the United States are eligible for FLAS Fellowships, which are funded by the U.S. Department of Education. Commitment to a career relating to Southeast Asia or involving use of the language to be studied. Appropriateness of the applicant’s chosen program of academic study and experience to meet his or her stated goals. 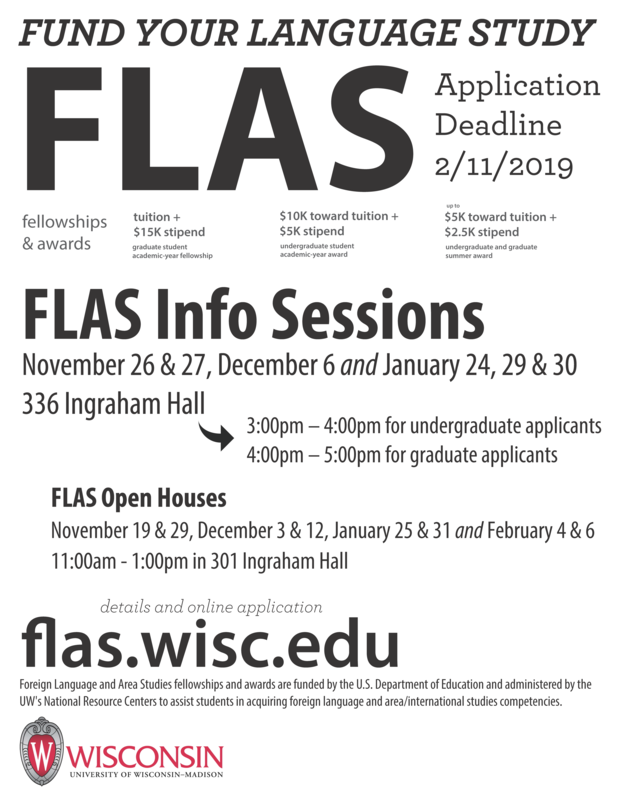 Information and applications for academic year FLAS Fellowships can be obtained from the University of Wisconsin-Madison’s FLAS website. For information about the Summer 2019 FLAS Fellowship competition, visit the SEASSI website. The Center for Southeast Asian Studies intends to award up to two (2) FLAS fellowships to undergraduate students who will be enrolled in 2019-2020 for intermediate (2nd-year), advanced (3rd-year), or higher level study of Filipino (Tagalog), Hmong, Indonesian, Thai, or Vietnamese at UW-Madison. Undergraduate FLAS Fellowships for the academic year provides a $5,000 stipend and $10,000 in tuition payments. Only citizens and permanent residents of the United States are eligible for FLAS Fellowships, which are funded by the U.S. Department of Education. In the awarding of these fellowships, priority will be given to students who are (1) studying one of the five Southeast Asian languages at the intermediate (2nd-year) level or beyond, and (2) students who are majoring in Southeast Asian Studies (BA in Asian Studies, concentration on Southeast Asia) or those who are working toward the Undergraduate Certificate in Southeast Asian Studies. Describe how your study of a Southeast Asian language at the intermediate or advanced level relates to your undergraduate education. Describe your present career goals and discuss how your undergraduate studies at UW-Madison, in particular your study of Southeast Asia and a Southeast Asian language, will facilitate your professional engagement with Southeast Asia after your graduation. The Center offers a limited number of graduate student fellowships supported by our endowment funds: Center Fellowships (for academic year support) and Center Field Research Grants (for field research projects). These awards are intended to support the study of Southeast Asia by graduate students in any department and are open to all students, including international students. The applications for Center fellowships for the 2019-2020 academic year are now available: you may download these here: Center Fellowships, and the Center Field Research Grant. See below for more information about these fellowship opportunities. Center Fellowships are awarded as Research Assistantships or Project Assistantships, and pay a modest living stipend, as well as provide health insurance and tuition remission. Fellowship recipients must be enrolled in at least six credits per semester of Southeast Asian Studies courses while receiving this fellowship. Who is Eligible: All students enrolled in graduate degree programs at UW-Madison and whose primary research area is Southeast Asia. Applicants can be at any level of graduate study, incoming students to dissertators. Deadline for Application: Tuesday, February 12, 2019. The application form and all supporting materials must be received at the Center by the deadline! 5. A statement of purpose that provides specific plans for graduate study and research and/or describes ongoing work and progress in thesis and/or dissertation writing. Please Note: If you are applying for a FLAS Fellowship and a CSEAS Fellowship for 2019-2020, you do not have to submit a separate set of supporting materials, but to be considered separately for the CSEAS Fellowships, you must submit the one page application form, and may have to submit a separate statement of purpose focused on your research activities and plan. CSEAS will also offer a limited number of field research grants for pre-dissertation, dissertation, and thesis research on Southeast Asia. These awards are supported from the Center’s endowment funds and are intended to provide limited support for travel (airfare, lodging, and per diem) and the acquisition of research-related materials. Grants will be awarded up to $7,000, depending on the nature of the research and the duration of the trip (from 1 to 4 months). These awards are not intended to cover the full cost of dissertation research but are aimed at providing funds: 1) to conduct pre-dissertation research aimed at enhancing major research proposals (Fulbright, SSRC, NSEP, etc) for dissertation projects; and 2) to facilitate or supplement field research for dissertation projects themselves. These awards are also not intended for travel to conferences or for short-term visits (less than 1 month). Applicants can use these awards to conduct research in Southeast Asia or at archives with holdings of relevant Southeast Asian materials. Field research awards cannot be held concurrently with Center or FLAS fellowships or with major external grants. They can be utilized before and after such grants, particularly when they pertain to aspects of the research project that are not covered by other support. Who is Eligible: Applicants must be graduate students at the University of Wisconsin-Madison with at least one year of graduate work completed. Pre-dissertators must have a letter from their departmental advisor clarifying that the field research is directly related to the intended dissertation (or thesis) topic and that it is aimed at strengthening the dissertation proposal and future applications for major dissertation research grants. Those applying for dissertation research must be dissertators by the time the field research begins. Please Note: If you are applying for a FLAS Fellowship and a CSEAS Field Research Award for the 2019-2020, you do not have to submit a separate set of supporting materials, but to be considered separately for the Center CSEAS Field Research Award, you must submit the one page application form, and may have to submit a separate statement of purpose focused on your research activities and plan. The Center may also nominate outstanding in-coming graduate students in the CSEAS MA program for two university-wide competitions: Advanced Opportunity Fellowships and University Fellowships. There are also a limited number of teaching assistantships in some departments offering high-enrollment courses on Southeast Asia. Information regarding these assistantships can be obtained directly from the Center or from the department offering the teaching assistantship. In addition to these opportunities, other fellowships and financial assistance are available outside the Center. All students with Southeast Asia interests should also visit the Institute for Regional and International Studies (IRIS Awards Office) website, where you can obtain useful information about other major sources of funding, including the Scott Kloeck-Jenson Fellowships and the IRIS Graduate Fieldwork Awards, as well as information about major dissertation fellowships and other funding opportunities. For further information about Funding Resources from outside the Center, in-coming graduate students should contact the Graduate Fellowships Office and Student Financial Services.